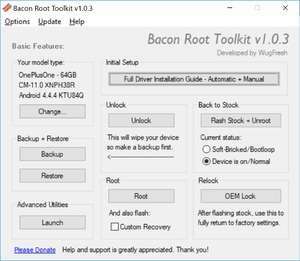 Bacon Root Toolkit is a useful and effective program created to help you perform a variety pf locking and rooting operations on your OnePlus One mobile phone. The application also lets you backup and restore the contents of your smartphone, ensuring you will not lose everything on the device, is something were to go wrong. For security reasons, you should also check out the Bacon Root Toolkit download at LO4D.com which includes virus and malware tests. Additional screenshots of this application download may be available, too.